Kamelot is an American metal band from Tampa, Florida, formed by Thomas Youngblood and Richard Warner in 1991. The Norwegian vocalist Roy Khan joined for the album Siége Perilous, and shared wrote songs with Youngblood until his departure in April 2011. Up to 2010, Kamelot had released nine studio albums (excluding two reissues), two live albums, one live DVD, and seven music videos. Its latest studio album is Poetry for the Poisoned, which was released in September 2010. Kamelot was founded in Florida by Thomas Youngblood and Richard Warner in 1991. Three years later, the band signed a deal with Noise Records and released its first album, Eternity, in 1995. The next album, Dominion, was released in 1997. Later that year, the drummer and founder Warner and the lead vocalist Mark Vanderbilt were replaced by drummer Casey Grillo and vocalist Roy Khan (formerly of Conception). With these two new members, Kamelot released its third studio album, Siege Perilous, in 1998. The band undertook its first tour during the fall, playing shows across Europe. Following this, the band returned to Tampa to write music for a new album titled The Fourth Legacy. In summer 2000, Kamelot undertook the "New Allegiance Tour" through Germany, Austria, Switzerland, the Netherlands, Belgium, Italy, Greece and Spain, during which the recordings for Kamelots first live album The Expedition were made. A few months later, the band released its fifth album, Karma. The sixth album, Epica, was released in 2003. To support the Epica album, the band toured through Europe (with At Vance as a supporting band) and Japan. Both Epica and the bands seventh album, The Black Halo, which was released in 2005, are based on Johann Wolfgang von Goethes version of the legend of Faust, a man who sells his soul to the devil. To support the new album, the band toured through Europe and Japan. During the first leg of the "Black Halo World Tour 2005", Kamelot played a headliner show with Epica and Kotipelto. In Japan, the supporting group was Silent Force. The band also played at the Bang Your Head!!! Festival in Germany and the Graspop Metal Meeting in Belgium. In 2005, Kamelot made its first music videos for the songs "The Haunting (Somewhere in Time)" and "March of Mephisto" from the album The Black Halo. Both videos were shot by the prolific director Patric Ullaeus. On October 5, 2005, Kamelot added Oliver Palotai as the fifth official band member; Palotai played both keyboards and (additional) guitars. On the second leg of the Black Halo World Tour, Kamelot visited North America (Canada and the United States), South America (Brazil), and Europe (Belgium, the Netherlands, Norway and Sweden). On February 11, 2006, the bands live DVD, One Cold Winters Night was filmed by Patric Ullaeus at the Rockefeller Music Hall in Oslo, Norway. It was released on November 17, 2006, in Germany, on November 20 in other parts of Europe, and on November 21 in the US and Canada via SPV Records. In fall 2006, the band returned to Gate Studios in Wolfsburg, Germany, to record the album, Ghost Opera, which was released on June 1, 2007, in Germany, on June 4 in the rest of Europe, and on June 5 in the US. The album was recorded and mixed at Gate Studios and Pathway Studios in Wolfsburg with the producers Sascha Paeth and Miro. Music videos were made for the songs "Ghost Opera", "The Human Stain", "Rule the World" and "Love You to Death". A re-issue of Ghost Opera, labeled Ghost Opera: the Second Coming, was released shortly after its predecessor. It contains the entire original Ghost Opera album and a second CD with ten live songs recorded during a concert in Belgrade, Serbia, with the additional bonus tracks, "Seasons End", "The Pendulous Fall", "Epilogue" and "Rule the World (Remixed)". In December 2009, Youngblood announced that the bass guitarist Glenn Barry had officially left the band and had been replaced by the touring bass gutarist and an original Kamelot member, Sean Tibbetts. 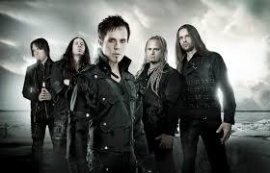 In January 2009, Kamelot started working on their ninth studio album, in a cabin in Norway. It was said that the band was exploring "new sounds" and that the topics on the new album would be diverse. During early 2010, Kamelot published the titles of three songs from the upcoming album on their official website: "The Great Pandemonium", "Hunters Season" and "Thespian Drama". They also revealed that guest musicians would appear: Simone Simons (whshe provided vocals for the ballad "House on a Hill" and the albums title track), and later Gus G, of the Greek power metal band Firewind. On March 25, 2010, they began the "Pandemonium Over Europe" tour, which ended on April 26, 2010. On September 6, 2010, the band announced that Khan had fallen seriously ill during rehearsals for the upcoming North American tour, just a few days before its scheduled start, and had returned to Norway. While it was initially reported that the band would continue the tour with the Norwegian vocalist Michael Eriksen of Circus Maximus (Norwegian band) in Khans place, the band later announced that it would postpone the tour with Khan, though one show was performed with Eriksen at the ProgPower USA XI festival in Atlanta, Georgia, on September 10, 2010. However, on December 16, due to Khans lingering illness, it was announced that Fabio Lione of Rhapsody of Fire would replace Khan for the remaining and rescheduled dates on the tour supporting Poetry for the Poisoned. On April 15, 2011, the band released Poetry For The Poisoned & Live From Wacken - Limited Tour Edition, containing the audio from Khans last recorded show with the band. Khan released a statement on April 21, 2011, and Kamelot released a statement on April 22, 2011, announcing he had left the band. According to Youngblood, the band was already searching for a new singer, with the deadline for submissions at the end of January. As previously stated, Fabio Lione of Rhapsody of Fire replaced Roy Khan as guest lead singer during the Pandemonium Over Latin America, Europe and North America tours in 2011 and the 70,000 Tons of Metal Cruise in 2012. Other guest singers appeared on selected shows, such as Simone Simons singing The Haunting and Dont You Cry, Tommy Karevik singing Center of the Universe, EdenEcho or The Human Stain, Snowy Shaw as Mephisto on March of Mephisto, Alissa White-Gluz also as Mephisto on March of Mephisto and Atle Pettersen on Karma. A North American tour has been scheduled for September and October 2012 as special guests of Nightwish and the first show with the new singer will be on July, 12th at Masters of Rock. On May, 25 SPV GmbH announced that Kamelot signed a contract to return to the independent German record label, that the eagerly awaited album has been scheduled for release on 24 September 2012 (Germany: 21 September 2012; US: 25 September 2012) and that the new vocalist will be announced in the end of June. Register now your email address and never miss events, dates and news for KAMELOT.